A couple of weeks ago I received a press release along with a bottle of both Melville’s Strawberry Beer and their Raspberry Beer. 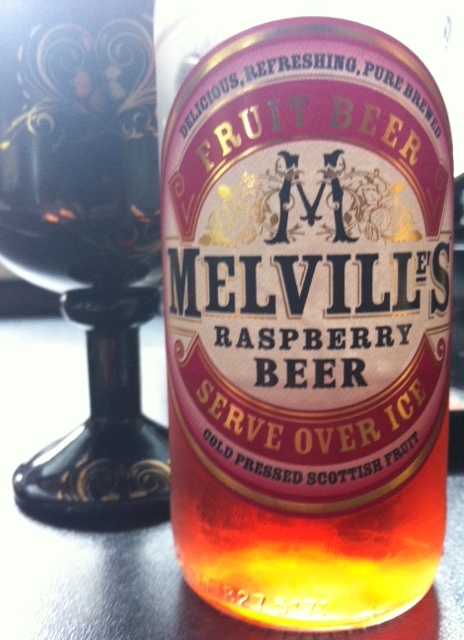 Melville’s is a new arm of Innis & Gunn and is the brainchild of Douglal Sharp who wanted to show off what he called some of the best fruit in the world and create a new summer thirst quencher. 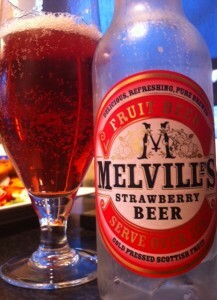 The beers use the juice of freshly pressed Scottish Raspberries or Strawberries which is supplied by Ella Drinks. 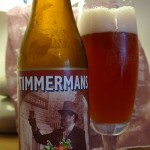 The beer is based on a lager brewed by Innis and Gunn and is then blended with the cold fruit juice. Being the gentleman that I am I shared both beers with my other half, as she’s a big fan of fruit beers but tends to like them a little sweeter than I do, though not too sweet or sickly. 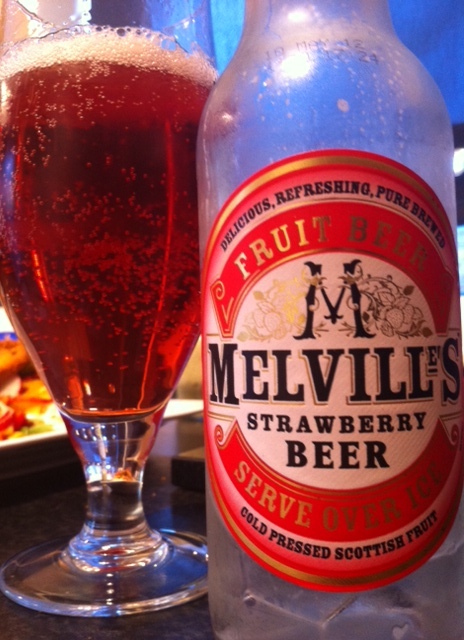 First up was the Strawberry version, there’s no hiding the colour of the beer, it’s clearly visible through the clear glass bottle (one of my pet hates) It pours quite flat and didn’t really have a head. 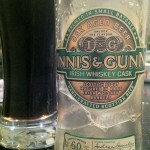 It smells distinctly Innis and Gunn with a sweet strawberry aroma…kind of what I expected. The carbonation was quite light and by no means flat, to me it tasted a bit like a strawberry boiled sweet (specifically those old Rancher sweets) which then had a bitter twang followed by a really sweet aftertaste. The strawberry was a lot more pronounced that I thought it would be and after smelling it I certainly didn’t expect the bitterness. Personally I found it too sweet, it also developed a strange flavour as it warmed up as a result I didn’t manage to drink the rest of my glass but my other half quite happily finished it off. Next up was the Raspberry beer, it was a slightly different colour as you’d expect, again it smelled mainly of the fruit but less of Innis and Gunn and generally less beery. 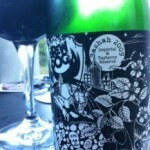 The flavour is predominantly slightly bitter raspberry followed by sweeter malt to balance it out, there’s also a hint of red grape juice in there too. It’s no where near as sweet as the strawberry one and and tastes more like real raspberries that the strawberry one did of strawberries. The bitterness at the end is a little bit more pronounced and doesn’t go into the sweet after taste. 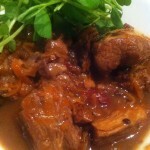 it also didn’t seem to develop the strange flavour as it warmed up which is definitely a bonus. We both agreed that this was by far the better of the two beers and one we would happily buy for a summer thirst quencher but whilst it’s a tasty drink it’s not quite on par with the fruit based offerings from our Belgian cousins. 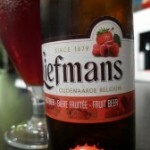 While the press release was an interesting read, I’m not sure I agreed with all of the comments in it, mainly because I am a massive fan of Belgian fruit beers and Lambics and some of the comments seemed to be having a dig at them and their packaging. Also I’m not sure any beer should ever be served over ice. 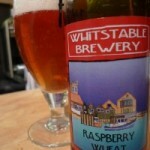 The beer is being sold through Tesco’s at £1.59 for the 250ml bottle and doesn’t seem to have a website.